Bring your own graph - The GraphGist challenge. Bring your own graph – The GraphGist challenge. Hi all, we have been working on an easy way to share your graph for some time, and we are proud to present you with the first ever GraphGist Challenge! 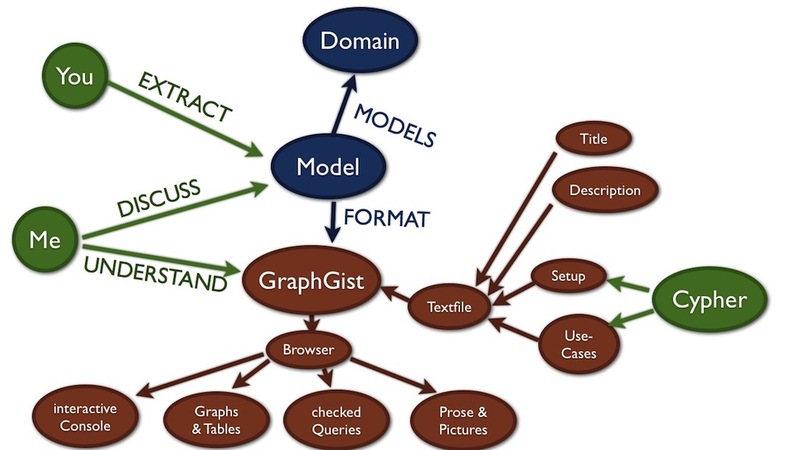 We want to encourage you to model a domain that you know / like in a graph model and describe it interactively in a GraphGist. A GraphGist is just a really simple AsciiDoc file, and can be hosted simply in a GitHub Gist. How to create a Neo4j GraphGist from Peter Neubauer on Vimeo. Whiteboard a good example graph model. Create Cypher statements for setup and query-use-cases. The graphgist needs to be public, so the ASCIIDOC source can be shown and linked. Write a good description and create a pretty model picture. Compose it all nicely in your asciidoc-graphgist-file. Tweet the public URL of your graphgist and add the tag #graphgist to the tweet.